Canyon Lake Vacation Rental #13589 LakeHouseVacations.com Rent Me! 2 bedroom 2 bath right on the Comal River! Brand New Listing! Beautiful 22.5 condo on the Comal River! Beautiful 2 bedroom, 2.5 bathroom condo at Camp Warnecke Estates is located on the Comal River (this unit does not have a river view but is just steps away from the river access); across the street from Schlitterbahn; an easy walk to the downtown shops, bars and restaurants. 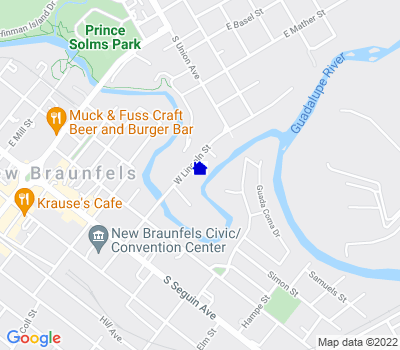 Enjoy Schlitterbahn located just across the street, float the Comal River and get out at your own backdoor steps or walk up to the Garden St. Bridge for a soothing 30 minutes of “Cruising down the River” – perfect for the little ones. Rockin' R is a local tube outfitter which can pick up in the parking lot next to Camp Warnecke between Memorial Day and Labor Day. For any reservation outside of that time period, the Rockin' R shop is located only .5 miles away. Enjoy the pool and hot tub or explore the beautiful Hill Country. It is the perfect location for your family vacation! The kitchen, dining area, and living room are a beautiful open area on the main level of the condo. Dining table seats four and there there is seating for two at the breakfast bar. There is also a half bath downstairs. There is a full sized washer and dryer, should you need them. Enjoy the cozy living room while watching cable TV or just relaxing after a day at the river! Upstairs is the master bedroom with balcony and private master bath with a walk-in shower and separate bathtub. This bedroom has a Queen size bed. The second bedroom also has a Queen size bed and its own bathroom. There are also 2 Twin size fold out beds available that can be placed anywhere you would like in the condo! All linens are furnished. There are 2 parking passes provided with one guaranteed numbered spot. The second parking pass is for general parking and is 'first come first served.' You will received 6 wristbands. The entrance of the condo is on the first floor, and all bedrooms are located on the second floor. Guests must be 25 years of age or older to make a reservation and must be staying at the property. No pets allowed. Guests will be allowed 2 vehicles on premise with parking passes and 6 wristbands (max amount allowed). This condo has a maximum occupancy of 6 guests. This maximum occupancy is not to be exceeded at any time. No daytime guests allowed. Great location!!! Condo is probably in process of renovation. In general condo was ok. However, there were some issues we encountered that weren’t up to par. Broken food disposal led to water leak, kitchen pots/pans & colander were rusty, trash of empty bottles & soda cans were tossed under kitchen sink, hair in 2nd bathtub, probably from previous attendants that cleaning crew missed, dead roaches on pot lid & front door. Property maintenance quickly &resolved broken disposal. Mgmt/owner provided good service. " Believe we were some of the first (if not the first) to stay in this condo. Still needs some tweaks and upgrades. Master bed was super soft and quite honestly "uncomfortable." The toilet in master sounds like jet taking off when flushed; blinds on front door need to be replaced. No ceiling fan in 2nd bedroom. Assigned parking place is very tight. Could barely get our standard sized SUV to fit next to another SUV the same size. "